KIKUYU turf is a very fast growing lawn and as a result requires mowing once to twice a week in warmer months of the year. 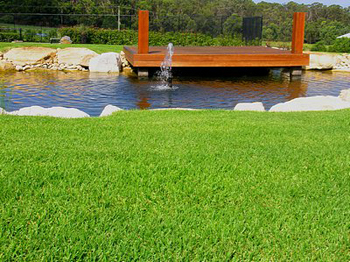 Lawn KIKUYU grows and develops when exposed to full sun and will not tolerate excessive dampness and shaded areas. Whilst KIKUYU grows well in summer and warmer months it still retains its colour quite well in the winter and colder months. KIKUYU turf is made up of a broad coarse leaf and can significantly improve the look and feel of your home or business environment. KIKUYU is a tough and durable turf variety that is a non allergenic turf that will still require regular fertilisation and watering. Its rapid growth rate means more regular mowing and maintenance especially in the warmer months but maintains its colour and complexion during most of the year. Our KIKUYU is cut daily to ensure you always get the highest quality lawn that will pass the test of time; we offer a pickup and delivery service so no matter where you are, you can get access to freshly cut turf that you can always depend on.